1 of 4 Heat a gas grill to medium-high or the coals in a charcoal grill to medium-hot. 2 of 4 Combine yogurt, mayonnaise, ketchup, relish and dried onion in a small bowl. Refrigerate until serving. 3 of 4 Lightly coat grill rack with oil or nonstick cooking spray. Grill mushrooms 4 minutes per side or until tender. Meanwhile, form beef into 4 thin patties, each about 3 1/2 inches in diameter. Grill about 2 minutes per side for medium. 4 of 4 To serve, set aside 4 bun tops. Spread 4 bun bottoms with 1 tablespoon of the yogurt mixture. Place a beef patty on each. 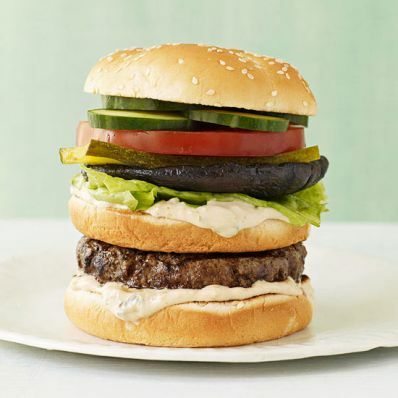 Top each with a bun half and repeat layering with yogurt mixture, portobello cap and, if desired, pickles, tomato cucumber and lettuce. Top each with a reserved bun top. Serve with any remaining yogurt mixture.